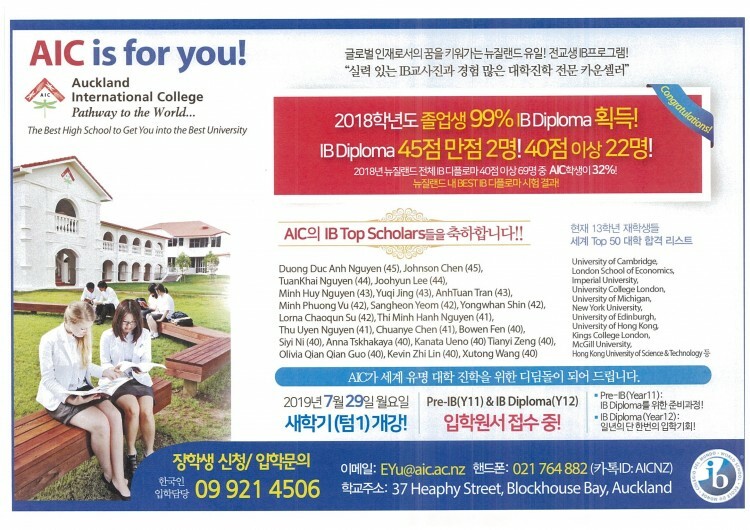 2018학년도 졸업생 99% IB Diploma 획득! IB Diploma 45점 만점 2명! 40점 이상 22명! University of Cambridge, London School of Economics, Imperial University, University College London, University of Michigan, New York University, University of Edinburgh, University of Hong Kong, Kings College London, McGill University, Hong Kong University of Science & Technology 등..
AIC가 세계 유명 대학 진학을 위한 디딤돌이 되어 드립니다. 열람중	 오클랜드 국제고등학교 [AIC] - 2019년 7월 입학 원서 접수 중!